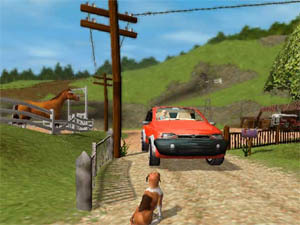 Dog's life is a new adventure game for young gamers by Sony that lets players literally step into the shoes of a dog. The game is a combination of arcade meets adventure in this light-hearted tale of a dog named Jake. The perfect life for a dog is lots of food, sleep and play but unfortunately for Jake, his life takes a devastating change when he witnesses his beloved playmate Daisy being kidnapped. Jake must now embark on a rigorous journey across America to not only rescue Daisy but also to discover himself as a young dog. 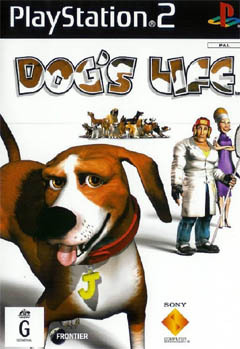 Similar to games such as Jak & Daxter, a Dog's Life has no specified levels but each area is flawless connected together to give the gamer almost 100% freedom. There is however a slight pause when the gamer moves between levels but it's nothing to take anything away from the gameplay of the title. 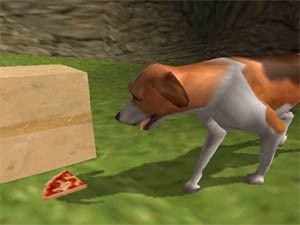 Apart from your main quest of rescuing Daisy, Jake must also perform a variety of mini-quests during his adventure such as recovering items, racing other dogs, collecting smells and a variety of dog-like objectives. The control system of a Dog's Life is extremely simplistic and will easily be mastered by young gamers. The basic control system for the game is a combination of the two analog sticks to control Jake and move the camera angles with the d-pad used to jump, bark, talk, pick up items and to engage in smell-o-vision. Smell-o-vision basically switches the game into a third person view and allows you to see from Jake's unique perspective. This also allows you to collect smells so you can help complete various objectives in the game. I did find this vision a little disconcerting at the start because it actually made me a little queasy. 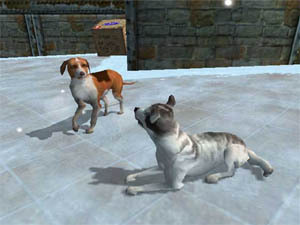 A Dog's Life also contains a variety of mini-games to ensure that the game doesn't become too repetitive. These mini-games include games with titles such as "Tug-o-war", "leg races", "digging" and my favourite game "territory marking". In order to engage in missions, Jake must "talk" to humans and listen to their problems. Although Jake cannot talk back, he can understand these strange humans and help them with the problem that they face such as finding batteries or collecting eggs. Graphically, a Dog's Life portrays the colourful world of a dog that kids will immediately bond with. The animation of Jake is quite accurate and actually moves like a real dog when he walks, sits, runs, jumps or performs those everyday dog feats such as wagging the tale or even swimming. The backgrounds of the game are extremely colourful and simplistic and seem to have been taken directly out of a children's book or cartoon show. There is also a variety of characters that Jake interacts with from a variety of dogs, chickens, birds and humans to name a few. Each of these characters look like their real-world counterparts and are all uniquely different. The developers have also done a great job at creating the 3D colourful world of Jake from realistic lighting and shadows to a variety of moving objects such as cars, animals and some extremely nice water effects. The game also contains some beautiful CGI cutscenes that help tell the tail (err... tale) of Jake. The musical score of a Dog's Life has a very laid back and mellow sound to it that is ideally suited for children, which this title is aimed at. The voice acting of the game has also been professionally done and suits each character perfectly. The actor who plays Jake helps portray a mischievous dog who has been given a task of rescuing his beloved friend Daisy. There are also a variety of other background sound effects in the game such as the sounds of radios, televisions, chickens, birds, cars that are basically the background sounds of life. Dog's Life is a game that is solely aimed at children that doesn't contain any gratuitous violence or sexual adult innuendos and I would recommend this game to all children because of the content. With an in-depth storyline, extremely colourful graphics and an easy control system, a Dog's Life is the perfect game for children to play at Christmas. Check it out!